The doctors' union, the British Medical Association, has agreed to begin negotiations about changing consultants' contracts. 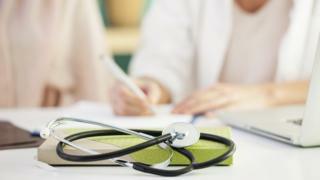 The government wants more senior doctors to work on weekends as part of its seven-day NHS plans in England. The BMA said it was prepared to negotiate ending the right to opt out of weekend work, but said there was still much to discuss. A Department of Health spokesman said it was "a positive step". In July, Health Secretary Jeremy Hunt said if the BMA did not agree by mid-September to enter serious negotiations over contracts - including the end of opting out of weekend work - he would impose changes to contracts for newly-appointed consultants. The current consultant contract means senior doctors can opt out of weekend work as long as it is non-emergency in nature - although they are still expected to be on call. But the BMA said the government had failed to set out what its policy meant in practice and what it would cost. Last week the chief executive of Nuffield Trust, which provides research on healthcare, said the plans would cost hundreds of millions of pounds and could be better spent elsewhere. But while Mr Hunt acknowledged there may be "upfront costs" of hundreds of millions of pounds, he said there may also be similar levels of savings because of improvements to the process of discharging people from hospital. The plans have angered many doctors, who argue that very few consultants opted out of weekend work and that most already worked on Saturdays and Sundays when required by hospital management, the BBC's health editor Hugh Pym said. But the BMA said it was now prepared to negotiate over the ending of the right to opt out and other contract changes. The union added there was still "much to discuss" and said any deal would be put to a vote by consultants early next year. A Department of Health spokesperson said it was "a positive step" and it was hoped an agreement could be reached quickly.